NEW YORK (Reuters) - Gregory Baron, 24, and Ben Nelson, 27, on Monday were eagerly purchasing $2 tickets for the Mega Millions jackpot in hopes of winning the record-setting $1.6 billion prize and becoming among the richest people in the world. "I would incorporate myself as a business and become my own company," Baron said inside the Port Authority Bus Terminal in Manhattan, adding that he would also pay off his student loans and parents' mortgage and donate to charities if he wins. "I would want to set myself up, but still be working so I don't erode into nothingness," Baron said. Lottery players face odds of 1 in 303 million of winning the Mega Millions drawing Tuesday night. In comparison, the odds of getting killed by a shark are 1 in 3.7 million in a lifetime, according to the International Shark Attack File. The Mega Millions website briefly crashed on Monday ahead of the drawing due to a surge in visitors, said a spokeswoman for the Maryland Lottery and Gaming Control Agency, which administers the website. Mega Millions set a world record for lottery jackpots after there were no winning numbers for the $1 billion prize on Friday. The previous record was a $1.586 billion jackpot for a Powerball drawing in 2016. About 280 million tickets were sold for Friday's drawing, with about 60 percent of all winning number combinations covered, said Seth Elkin, a spokesman for the agency. Tickets sold for Tuesday's drawing are expected to cover 75 percent of all possible number combinations, he said. Nelson, a post-production manager based in Manhattan, said if he wins the jackpot he would travel and buy a farm in northern California where he would raise Bernese Mountain Dogs. "You'd get all the boring stuff out of the way early, then I'd make a feature film," he added. In Chicago, a crowded newsstand inside the city's Ogilvie Transportation Center was unable to display the record-setting prize amount because $999 million was the highest number its electronic sign could show. "It's only two dollars. I’m spending my coffee money on this today," said Rita Gomez, a 51-year-old self-described occasional lotto player who was purchasing tickets for herself, her sister and two friends at a convenience store in Chicago. Wednesday's Powerball lottery prize stands at $620 million, making it the fifth largest jackpot in U.S. history, after no one got all six numbers in Saturday's drawing. The lump sum cash payout is estimated at $354.3 million. If there is more than one winner, the jackpot would be divided proportionately, as happened in 2012 with a Mega Millions jackpot of $656 million, a lottery official said. 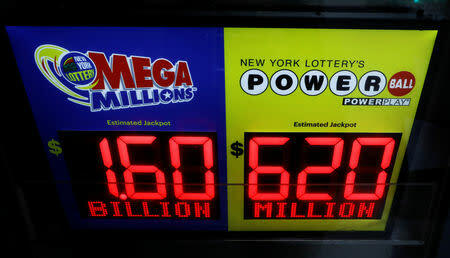 Mega Millions tickets are sold in 44 U.S. states, the District of Columbia and the Virgin Islands. Several states allow online ticket purchases, but they prohibit out-of-state and foreign purchases. Both lottery jackpots have been increased recently by rule changes that have reduced the odds of winning. The odds of winning Mega Millions were lowered a year ago from 1 in 259 million to generate larger prizes. "I'll never win, but you gotta give it a shot," Hank Kattan, 75, said in Manhattan. "I'd like to change my way of life."